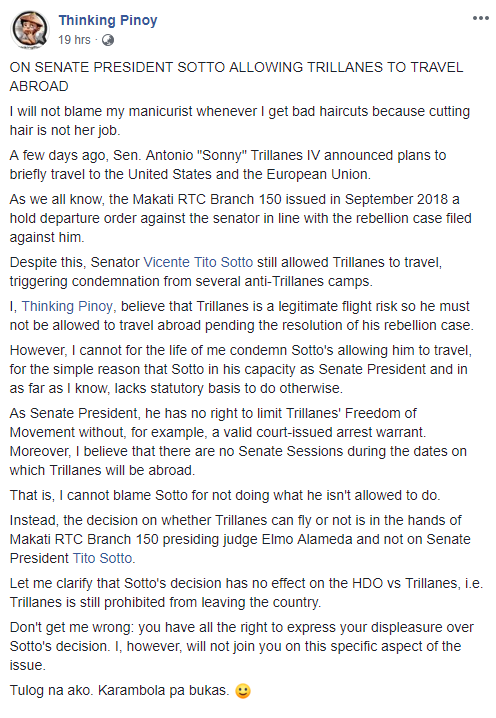 Home / Opinion / Blogger TP on Sotto allowing Trillanes to travel Abroad: "I cannot blame Sotto.."
Blogger TP on Sotto allowing Trillanes to travel Abroad: "I cannot blame Sotto.."
Popular blogger, Thinking Pinoy once again posted a very striking opinion this time regarding Senate President Vicente Sotto III authorizing Senator Antonio Trillanes IV to travel abroad. It was reported earlier this week that the senator, who is now out on bail for a revived rebellion case has allegedly requested the Makati court to enable him to make a trip to to the United States and the European Union to perform official duties. According to reports, attached to Trillanes' motion were two travel orders by Senate President Vicente Sotto III approving him to head out to the four nations at no expense to the Philippine Senate, regardless of the fact that there is a hold departure order against the said senator. This act of Senate President Sotto as per Thinking Pinoy blogger, RJ Nieto, then again sparked judgment from numerous anti-Trillanes camps, causing resentment to the Senate President. The popular blogger thereupon came to the Senate President's defense and said that he actually understand and will not in anyway blame the latter enabling Trillanes to travel, for Sotto might be inadequate with legal basis not to permit the senator. 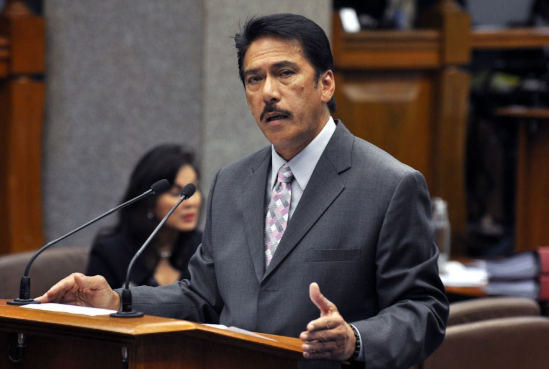 "However, I cannot for the life of me condemn Sotto's allowing him to travel, for the simple reason that Sotto in his capacity as Senate President and in as far as I know, lacks statutory basis to do otherwise. ", TP wrote. He likewise said that although he believes that Trillanes is a genuine flight risk and must not be allowed to travel, Sotto still has no right to constrain the senator's Freedom of Movement. 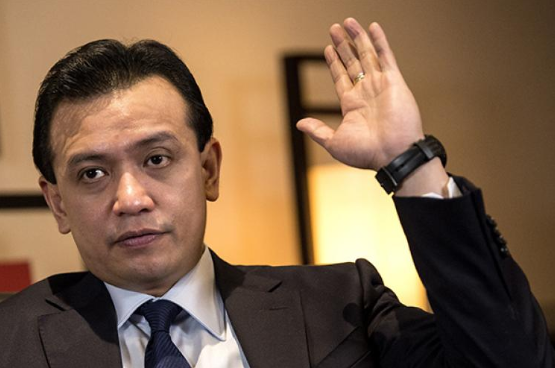 "I, Thinking Pinoy, believe that Trillanes is a legitimate flight risk so he must not be allowed to travel abroad pending the resolution of his rebellion case." the blogger uttered. "As Senate President, he has no right to limit Trillanes' Freedom of Movement without, for example, a valid court-issued arrest warrant. Moreover, I believe that there are no Senate Sessions during the dates on which Trillanes will be abroad. ", he added. Nieto also made clear that Sotto's choice has no impact on Trillanes hold departure order as the latter is as yet precluded from leaving the nation, hence, pronounced that others have the privilege to express their disappointment over the senate president but he however will not unite with them on the issue. "Let me clarify that Sotto's decision has no effect on the HDO vs Trillanes, i.e. Trillanes is still prohibited from leaving the country." TP stated. "Don't get me wrong: you have all the right to express your displeasure over Sotto's decision. I, however, will not join you on this specific aspect of the issue." he ended. "ON SENATE PRESIDENT SOTTO ALLOWING TRILLANES TO TRAVEL ABROAD"
"I will not blame my manicurist whenever I get bad haircuts because cutting hair is not her job. A few days ago, Sen. Antonio "Sonny" Trillanes IV announced plans to briefly travel to the United States and the European Union. As we all know, the Makati RTC Branch 150 issued in September 2018 a hold departure order against the senator in line with the rebellion case filed against him. Despite this, Senator Vicente Tito Sotto still allowed Trillanes to travel, triggering condemnation from several anti-Trillanes camps. I, Thinking Pinoy, believe that Trillanes is a legitimate flight risk so he must not be allowed to travel abroad pending the resolution of his rebellion case. However, I cannot for the life of me condemn Sotto's allowing him to travel, for the simple reason that Sotto in his capacity as Senate President and in as far as I know, lacks statutory basis to do otherwise. As Senate President, he has no right to limit Trillanes' Freedom of Movement without, for example, a valid court-issued arrest warrant. Moreover, I believe that there are no Senate Sessions during the dates on which Trillanes will be abroad. That is, I cannot blame Sotto for not doing what he isn't allowed to do. 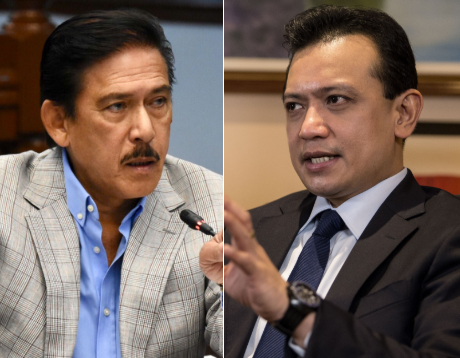 Instead, the decision on whether Trillanes can fly or not is in the hands of Makati RTC Branch 150 presiding judge Elmo Alameda and not on Senate President Tito Sotto. Let me clarify that Sotto's decision has no effect on the HDO vs Trillanes, i.e. Trillanes is still prohibited from leaving the country. Don't get me wrong: you have all the right to express your displeasure over Sotto's decision. I, however, will not join you on this specific aspect of the issue. Tulog na ako. Karambola pa bukas."